Some are scaly and walk on webbed feet through shallow marshes. Others linger in the water, slimy and waiting for human toes to snack on. Most of them are blood thirsty. Many are merely curious. There are those who dwell on land, hiding behind trees and roots the color of mud. These creatures can run quicker than the fastest man. Beware: They’ll catch you if they can. They are the creepy critters childhood nightmares are made of. But this isn’t a book of child’s play. Instead, it is of the creeps whom even the bravest of adults is most certainly afraid. 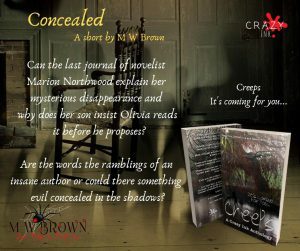 My short story, Concealed, is in this creepy anthology. The diary of a famous novelist is given to her son’s fiance. What secrets does it contain?